When is a cheesecake not a cheesecake? When it’s clever mix of cashews and blueberries that make a delicious, creamy berry dessert. I made it for the first time when friends came over last week and it was a big hit. 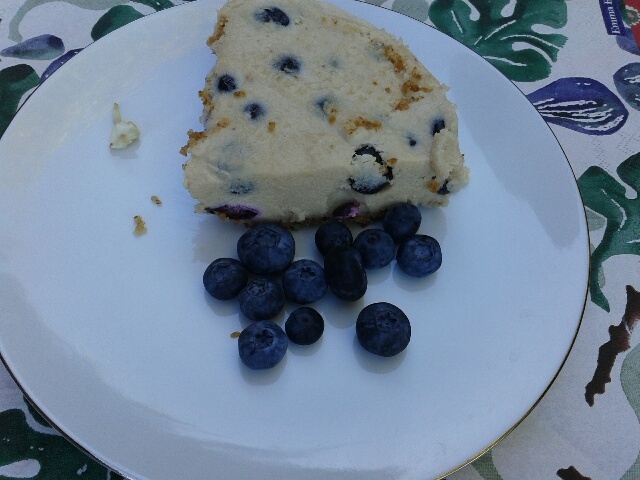 Though I say it myself, I think it tastes better than real cheesecake which can be a bit bland. I used big, juicy English blueberries – in season now – but frozen work too. The blueberry “jam” to serve with the cake (not shown because it was all gobbled up before I got the chance to snap it) adds a special touch. Update October, 2018: Recently, I tried this recipe with the chopped flesh of two ripe mangoes, instead of blueberries, added some lime zest and and swirled in a handful of raspberries. The chia seed and fruit “jam” was made from raspberries. In fact, you could use just about any fruit, fresh or frozen. Be creative! It’s all-vegan, gluten- and dairy-free and packed with nutty goodness. Blend all of the ingredients in a food processor until they come together to form a dough. Press the mixture into a silicone cake case. If you don’t have a silicone case, line a freezer proof cake case with baking parchment. Blend all of the ingredients, except the berries, until the mixture is smooth. Stir in the blueberries and pour the mixture into the cake case. Smooth the top with the back of a spoon. Place the cake in the freezer for at least 6 hours to set hard. Remove from the freezer about 2 hours before serving. Tip: It’s easier to remove the cheesecake from the case while still frozen. Heat the berries in a pan with a few teaspoons of water until they start to go mushy. Allow to cool slightly then stir in the chia seeds. Leave the jam for about 15 minutes to thicken and serve with the cheesecake. You can try this cheesecake with just about any fruit combination. See my suggestion above for mango, lime and raspberry.